We have some pasture-raised pigs available. This year’s batch is going to be good-sized, with a half-pig yielding 100 pounds of wrapped freezer meat, give or take. Call it five paper shopping bags full. These pigs have been fed not only on custom-milled feed, but whole wheat, all our cracked and otherwise unsaleable free-range eggs, and bushels and bushels of carrot tops and other scraps from Gathering Together Farm’s market booth. Pork is the ultimate luxury meat: bacon, ham, sausage, pork chops (mmm … pork chops). It’s a purchase you won’t regret, even if you need to buy a chest freezer while you’re at it. Everyone needs a chest freezer. Tempted? Contact my wife Karen Black at karen@nortoncreekfarm.com, or drop by the Corvallis Wednesday or Saturday farmer’s market and talk it over. In the end, you’ll write two checks: One to us and one to the custom butcher, Farmer’s Helper in Harrisburg, Oregon. We charge $4 per pound, hanging weight, and the Farmer’s Helper charges, um, quite a bit less (I don’t have the numbers in front of me). They’ll prepare your pork according to your instructions (thin/medium/thick bacon, whether the portions that end up ground become pork sausage or porkburger, whether you want pork chops or loin roast, etc.). Wondering about winter lighting for hens? Some people claim that putting lights on hens is like espresso, making them all jittery and hyperactive, and causing them to shoot out eggs like a machine gun, deflating the poor hens like a balloon and causing them to die before their time. Use a day length of 14 hours, such as 6 AM to 8 PM. In my latitude, doing this without wasting too much electricity can be done using a plug-in timer set to turn the lights on at 6 AM, off at 9 AM, on at 4 PM, off at 8 PM. An “on at dusk/off at dawn” sensor is also good for turning the lights off during the day. Don’t mess with batteries or solar panels, which are expensive and labor-intensive. Use electrical tape to wrap the connections between two extension cords, lamp plugs, or three-way outlets to keep them clean. Elevate connections above the ground. We’re using step-in fence posts for this. Outdoor-rated LED bulbs are best. Many LED bulbs are outdoor-rated (“suitable for damp locations”), but check the packaging. You can use a 25-watt-equivalent bulb for a 64-square-foot house, but a 40-watt-equivalent bulb is okay, too, and easier to find. Compact fluorescent bulbs are fragile and don’t like to start in cold weather; incandescent bulbs use a lot of power. Reflectors are not necessary. “Daylight” bulbs don’t help, and may work less well than normal LED bulbs. Malnutrition or starvation of the chickens,especially baby chicks. Note the total lack of overlap! Starving chickens and chickens carried off by predators and chicken thieves don’t need vaccination or a pedigree: they need feed and protection. Disease is not commonly associated with the high mortality, the steady rate of attrition being unlike that of an infectious or parasitic disease. The primary cause is starvation (Prawirokusomo, 1988; Ologhoho, 1992; Roberts & Senaratne, 1992), the chicks and growers which die tending to have lower growth rates than the average for their brood (Wickramaratne et al, 1993). The growth rates of survivors to 70 days ranged from 2 to 7 g/day with a mean of 4.4 (Gunaratne et al., 1993). Chicks and growers which die, also tend to be those with lighter feather colors, that is, those which are more conspicuous (Wickramaratne et al. 1993). Predation is the ultimate fate of most chicks and growers (Branckaert, 1992; Roberts & Senaratne, 1992; Gunaratne et al. 1993; Wickramaratne et al., 1994). Presumably anything which weakens a chick, such as inadequate nutrition, infection or parasites, increases the likelihood of it being taken by a predator. And it offered a very simple means of reducing mortality: creep feeders for baby chicks (a creep feeder is often used for sheep and calves, who can creep under the bottom rail of a fence an reach a feeder that the adult animals can’t reach. The same idea works for baby chicks: give them the high-grade feedstuffs they need only in tiny quantities, while preventing the bigger chickens from gobbling it down instead). Placing household refuse in a creep feeder for chicks in villages, for a short period, twice a day, increased the survival rate; but did not improve the growth rate. Supplementing the household refuse with protein improved both survival rate and growth rate (Roberts et al., 1994). It’s sad that simple, appropriate, well-researched techniques are so often ignored. Win a Free Copy of Fresh-Air Poultry Houses! Why should you have an open-air coop this winter, instead of a tightly enclosed one? Find out by buying (or perhaps by winning) a copy of Fresh-Air Poultry Houses by Prince T. Woods, M.D. This is the best book I’ve been able to find on the subject, covering fresh-air coops and many other topics. It’s an older book, from 1924, but it’s chock-full of good ideas that you won’t find anywhere else. Traditionally, October is a month where pullets are just about to lay, and are moved from pasture (where they had been raised) and into winter quarters that are much closer to the farmhouse, and thus more convenient for winter access. Because many of the old hens were still around, there tended to be more chickens than there were room for in the winter houses. 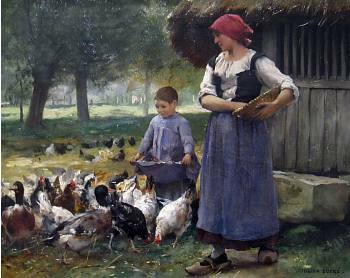 The usual technique was to cull all the early-molting hens, but to keep the rest for another year. About half of the old hens would be sent to market this way, sold as stewing hens. The winter flock would thus be about one-third old hens and two-thirds young pullets. With modern hybrid layers, the flocks are much more uniform, and most of the flock will molt at once. Only a few percent will molt early. So the idea that you can sort the flock into 50% winners and 50% losers doesn’t work very well anymore. They’re mostly winners. October is the start of a big shift in what your chickens need from you. It only takes a few months of warm weather to make you blind to the needs of approaching winter, so this month’s checklist is particularly important–especially if you follow it! House pullets (if raised on range). Repair doors, windows, cracks, roofs, watering systems, lighting systems. Remove damp or dirty litter on an ongoing basis. traditional. Incandescent bulbs are much more trouble-free than compact fluorescents, but LED bulbs are best. Don’t use “indoor-only” compact fluorescents in a chicken coop). Get equipment put away, under cover. Don’t forget the lawn mower! Summer houses such as tarp-covered hoophouses should have their tarps removed so they won’t collapse under snow loads. stuck on the tops of T-posts are traditional ways of marking hazards. List inspiredby a similar one in Jull’s Successful Poultry Management, McGraw-Hill, 1943.